KUWAIT CITY, DEC 7 2015 – Kuwait today launched a major initiative to spur sustainable development across Africa with an annual prize recognizing the best research or development advances in food security, health and education that contribute to significantly solving development challenges facing African nations. Named the ‘Al-Sumait Prizes’ after the late Dr. Abdulrahman Al-Sumait, a Kuwaiti physician who devoted his life to helping the poor in Africa, the initiative was endorsed at the first meeting of the Al-Sumait Board of Trustees in Kuwait. Each prize will encompass a sum of one million US dollars, a gold medal and a certificate of recognition to be awarded annually to individuals or institutions achieving a significant advance. The Board comprises prominent personalities in the field of development in Africa and renowned philanthropists, including H.E. 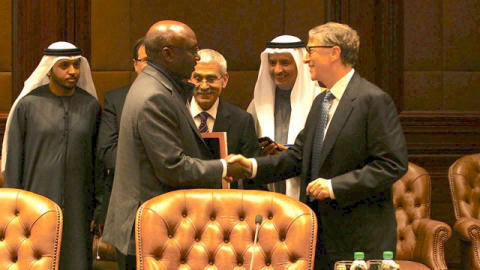 Sheikh Sabah Khaled Al-Hamad Al-Sabah, First Deputy Prime Minister and Minister of Foreign Affairs of the State of Kuwait, Mr. Bill Gates, Co-Chair of the Bill & Melinda Gates Foundation, and Dr. Donald Kaberuka, Former President of the African Development Bank. Commenting, H.E. Sheikh Sabah said the main objective of the Al-Sumait prize is to promote positive change across Africa, which stems from Kuwait’s goal to raise ‘the level of Afro-Arab cooperation at all levels, especially in humanitarian, development and economic fields’. The Al-Sumait Prize Secretariat – the Kuwait Foundation for the Advancement of Sciences (KFAS) – said the 2015 prize would encompass ‘Health’, while the 2016 prize will be awarded for ‘Food Security’. Both prizes will be presented to winners at a ceremony during the 4th Arab African Summit in Equatorial Guinea, November 2016.